Picture from group : Stoney Top, centre, is overshadowed by Tonelagee to the left. Picture: Stoney Top, centre, is overshadowed by Tonelagee to the left. High bump on ridge, useful in routes. Stoney Top is the name given to a bump on the ridge leading north from Tonelagee. It will usually be included in longer walks, not normally being a target in itself. 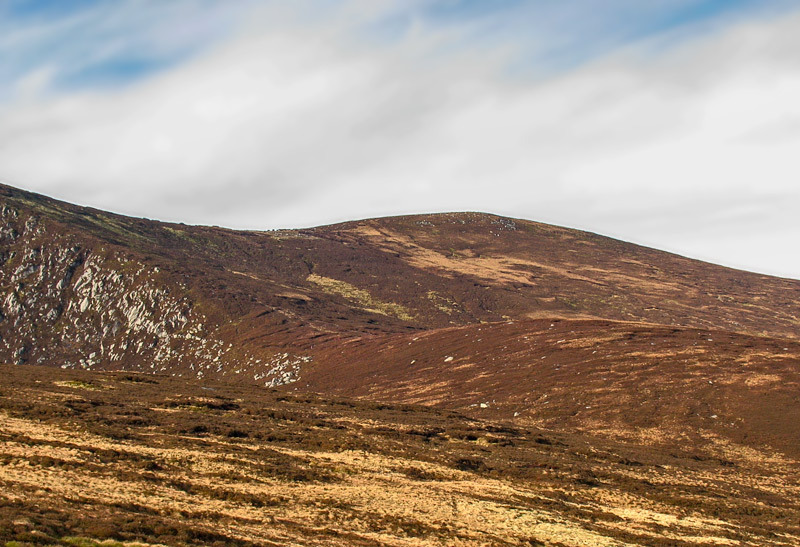 Mullaghcleevaun to Tonlagee via Stony Top takes you across a lunar landscape of peat hags and bogs. Allow more time for the traverse than a cursory glance at the map would suggest! 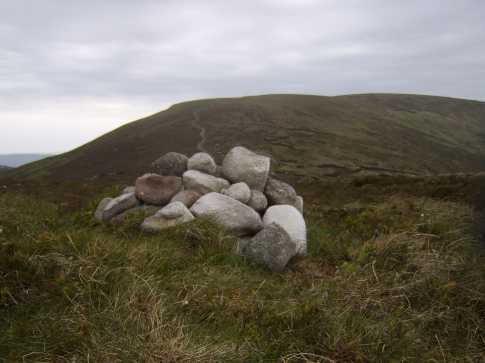 Picture from kaybee : Stoney Top cairn fronting the well-worn trail on up to Tonelagee. Picture: Stoney Top cairn fronting the well-worn trail on up to Tonelagee. Climbed Stoney Top yesterday as part of a hill trio - Carrignagunneen, Stoney and Tonelagee. Ascended Carrignagunneen from forest track at O04860 03360 B, a quick bash through the trees (note that Map56 incorrectly shows clear mountainside on the right of this track, there is quite a forested area here, see the more factual Harvey map) and up through the heather to the featureless, unmarked 561m summit. From there, I dropped east to the forest edge at O06000 03170 C and followed the perimeter before entering the forest by means of a firebreak at O07160 03620 D. Continue for 300m and you will meet forest track, this is not shown on the OS map, but is accurate on the Harvey. Headed directly SE to Stoney Top from here through a felled area of forest (not shown as cleared on either map being relatively recent Coillte work, probably).